Ride and Read! NEWS by Madness Photography - Onno "Berserk" Wieringa: David Uhl and Uhl Works Designs "Loud & Proud"
Sturgis, South Dakota - World renowned artist David Uhl and designer Danial James of Uhl Works, along with the Legendary Buffalo Chip, have announced an official association for this year's Sturgis Rally. In 2012, Uhl Works will be located onsite at the Buffalo Chip's Public Art Gallery. In celebration of this new relationship, Uhl has designed an original limited collectors series lithograph (18" x 24") that will be available with and without a matching men's and women's shirt that portrays the original artwork. Starting this week, these items will only be available online, exclusively at www.BuffaloChip.com, and are offered on a first come first serve basis. The lithograph can be purchased separately or the shirt can be bundled with it as a value-added package. The original lithograph Design/Artwork "Loud & Proud" celebrates the Buffalo Chip's tradition of being the premier accommodation and concert venue for the rally. The shirts are crafted in a twelve-color men's and women's pima cotton mineral wash tee. Both garments portray Uhl Works' Buffalo Chip Lithograph, are of fine quality, and include embroidery, patchwork and many other features that make Uhl Works apparel popular. In addition to displaying David Uhl's fine art at the Buffalo Chip, Uhl Works will also display their entire gallery of specialty Uhl Works apparel at the new CrossRoads area at the Buffalo Chip, alongside the band stand and the 53,000 pound sculpture. For those who would like to increase the collectability of lithographs and shirts, there will be scheduled signings at the gallery by David Uhl and Rod "Woody" Woodruff. The schedule of the signings will be announced in the last week of July. Uhl Works is located at 15801 West Colfax Avenue in Golden and specializes in a unique brand of hand crafted drawings and paintings, tastefully imprinted on high-end apparel. Uhl Works was formed by David Uhl and Danial James. Through their long-standing collaboration, David Uhl and Danial James have produced a body of work that spans over 20 years and includes hundreds of the top selling T-shirt designs for the motorcycle industry. David Uhl is officially licensed by Harley-Davidson and recognized for his unique style and vintage motorcycle paintings. His artwork is displayed throughout the world, and sought by prominent art collectors and celebrities alike. You can visit Uhl Works at www.uhlworks.com. Sturgis Buffalo Chip 2012 will take place August 3 – August 11. In 2012, The Largest Music Festival in Motorcycling™ and the Sturgis rally's cornerstone event will celebrate its 31st consecutive annual concert series. 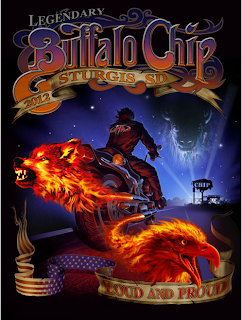 Since 1982, the Sturgis Buffalo Chip has provided unforgettable live music experiences for fans from around the world. The Sturgis Buffalo Chip attracts the music industry's hottest stars, emerging talent and local favorites, and hosts a diverse selection of food and beverage vendors and interactive exhibits. Set on 580 acres, three miles outside of Sturgis, the Buffalo Chip is a festival experience like no other. More details are available at BuffaloChip.com. Labels: David Uhl and Uhl Works Designs "Loud and Proud"